In Kings of the Storm, House Baratheon sees a deepening of its native strengths, as well as some crafty new tricks. 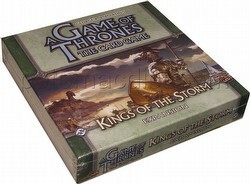 Kings of the Storm includes 165 cards - three copies each of 55 unique cards - featuring not only cards for House Baratheon but also neutral cards and plot cards that will easily find their way into the decks of any House. Also included with this expansion are two deck lists designed to give players strong insight into House Baratheon's native strengths and synergy, designed by 2009 Melee World Champion Jonathan Benton and Wade Freeman.